On his official Twitter account, NATO deputy spokesman Piers Cazalet posted a short clip called, "What are today's security challenges?," listing an "assertive" Russia alongside terrorism, cyber attacks, and other potential threats to the alliance. The Russian "challenge," according to the clip, includes "its military build-up close to NATO's borders." The clip is an excerpt from a longer video called: "NATO: What is it, why does it still exist, and how does it work?" — Piers Cazalet (@NATODepSpox) 9 августа 2018 г.
Cazalet's tweet, retweeted by NATO's main account, has been almost universally derided by social media users, who panned the video for its absurd arguments. — Romus Ramström (@Romussw) 10 августа 2018 г. — china (@mapon888) 10 августа 2018 г. — Мартиновић🇷🇸1244 (@Trza1389) 9 августа 2018 г.
Russian Twitter users also got in on ridiculing the claims, particularly after being informed of the clip's existence by Russian media. "Yes, Russia's so dangerous that every year it's moving its territory closer to NATO's," one user joked. "You guys are the ones on our borders, fools!" another insisted. "Yeah right, and NATO is soft and fluffy," a third wrote. "Are they rolling a dice or tossing a coin [to determine who the enemy is]? First it's North Korea, then Iran, then us," another commented. On Friday, a Spanish Defense Ministry spokesperson told Sputnik that Madrid would not rotate its personnel out of the Baltics after an incident this week involving a Spanish pilot accidentally firing an air-to-air missile during a flight over Estonia not far from the Russian border. 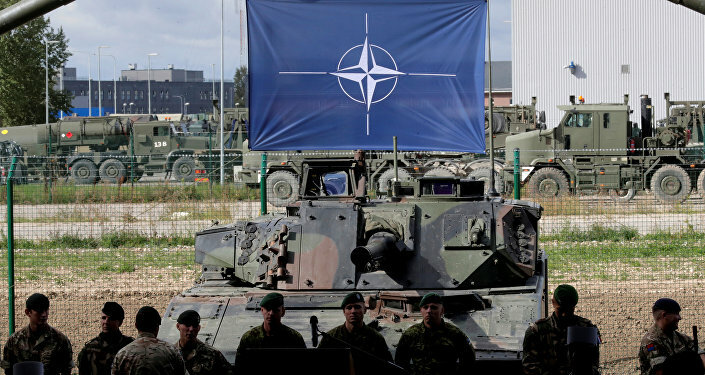 NATO has substantially ramped up its military presence in the Baltic countries, Poland, Romania and Bulgaria following the Western-supported coup d'état in Kiev in 2014, which sparked a civil war in eastern Ukraine, which the alliance has blamed on Russia. Since 1990, NATO has swallowed up all the former members of the Soviet-led Warsaw Pact and expanded into the Baltic republics. The former Yugoslav republics of Slovenia, Croatia and Montenegro have joined, along with Albania, and Macedonia invited to become the alliance's 30th member. Before the enlargement began, German and US officials made informal guarantees to Soviet leader Mikhail Gorbachev that NATO would not expand beyond the borders of former East Germany after Germany's unification.